Another image from my recently completed travels through Indonesia. There is no shortage of interesting details to be found around each corner. I’ll refer to this as a carefully composed study and took my time to assess the lines, shapes, colours and forms, before tripping the shutter. Perhaps we might call it a “quiet” and even “contemplative” image, and in keeping with that feeling, I’ve kept the processing of the image as subtle as possible. Are you an inexperienced cook or a chef? I sometimes like to think of image processing as analogous to cooking. The inexperienced cook knows that herbs and spices can improve a dish and reasons that, if a little spice is a good thing, then a lot of spice must be even better! In doing so his resulting meal will be over powered by spices and not memorable (or at least not memorable for the right reasons!). The experienced chef understands that the value of herbs and spices lies not in their dominating the dish but, through subtle application, enhancing or accenting the flavour of the main ingredients. As so it is with digital processing of photographs. It is all too easy to be seduced by the adjustment capabilities of our digital photography processing software. A bit more contrast, a bit more colour saturation, etc, and we feel empowered, we have the herbs and spices just a mouse click away. So like the new cook, it’s tempting to grab that enhancer and give it heaps! That contrast slider goes all the way to 100, so does the colour slider. Want to get real funky? Grab hold of that colour temperature adjustment and give it a good yank. Big vignettes anybody? And so on. The result? Well you end up with an image which is a total distortion of reality, an image which is about the effects and not the actual subject of the photo. Like the chef, the thoughtful photographer understands that subtly is the key. The subject, the main ingredient of the dish, is to be enhanced, accented, not overpowered. My own feeling on the subject is (generally speaking) that if the adjustments are obvious then they are too heavy handed. If someone looks at one of my photos and can say, “I see you added a vignette” for example, then I’ve probably failed. With all that said, today’s image had 4 separate local adjustments applied. I’d be surprised if anyone could say, with confidence, what they are. 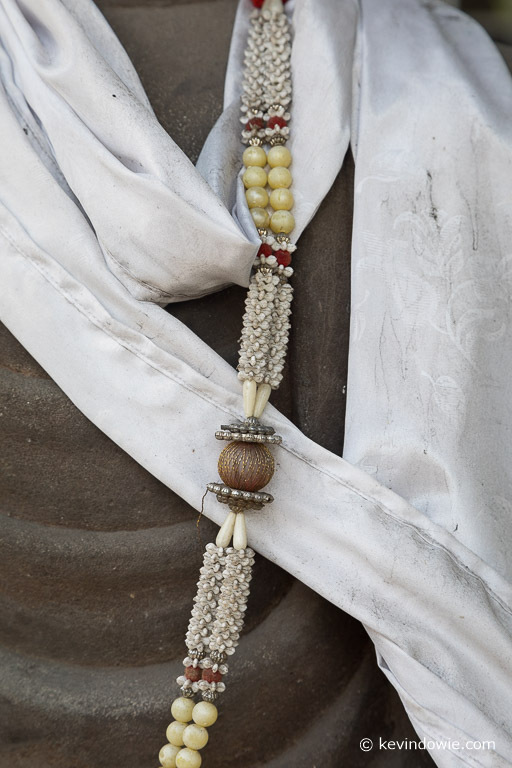 Adornments for a statue, Bali.